UPDATED: Sat., Nov. 1, 2014, 11:41 p.m.
Saturday: Washington State Cougars (2-7, 1-5 Pac-12) at Oregon State Beavers (4-3, 1-3), 1 p.m.
PULLMAN – The Cougars seemed destined to lose the game early on, but evidently that wasn’t enough. A second consecutive blowout home loss, one that officially knocks Washington State out of the postseason, in a mixture of swirling fog and rain that was surely designed in a lab to be the worst possible football playing conditions was only a small part of what stunk for the Cougars during a 44-17 loss to USC in front of far fewer than the reported 25,012 souls on Saturday. Another special teams touchdown – the sixth the Cougars have given up in nine games – for the game’s first score was disheartening enough and seeing high school-aged defenders chase five strides behind USC’s NFL-ready receivers on five passing touchdowns was nothing new. 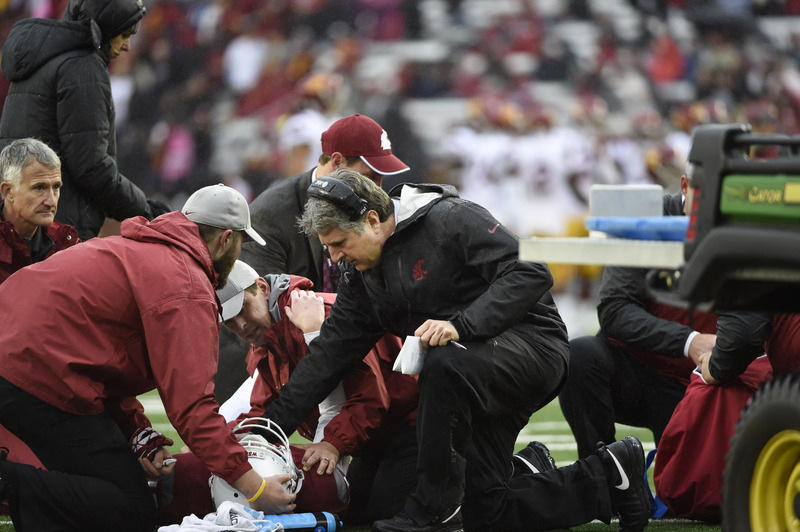 But there is little that could have gone wrong for the Cougars in this or any game to compare with quarterback Connor Halliday getting carted off the field after completing a 14-yard pass to Vince Mayle in the first quarter. Star USC defensive lineman Leonard Williams slipped past WSU center Sam Flor on a twist. As Flor tried to push the likely first-round NFL draft pick away from his quarterback, Halliday tried to spin away from the oncoming mass of linemen and his right leg was ultimately trapped under both players. Reports came out shortly after that Halliday suffered a broken leg. Mike Leach couldn’t confirm the exact nature of the injury but did say that Halliday was undergoing surgery after the game. Regardless, the injury almost certainly ends the collegiate career of a quarterback that set college football ablaze this season and became a bright spot that made a struggling WSU (2-7, 1-5) team always worth watching. He entered the weekend leading the country in passing yards by about three games. He set NCAA records for passing yards and attempts in a game and already owns the school record for career passing yards. More importantly he was an unapologetic competitor for a program that sorely needed one. Backup quarterback Luke Falk – a walk-on last season who got his scholarship shortly after fall camp back in August – played well and it’s unlikely Halliday would have made the difference with the Trojans already leading 14-0 when he was injured. He likely would have been as hampered as Falk was by a normally steady receiving corps that suffered an abnormal amount of dropped passes, often in key situations. “They hit guys right in the chest, hands and gut and if they were bullets it would have killed them,” Leach said. Halliday couldn’t have helped the secondary keep up with Nelson Agholor and Juju Smith, freak receivers who put up 294 receiving yards and four touchdowns by themselves for USC (6-4, 5-2). For the second consecutive week true freshman Pat Porter started at boundary cornerback and Kevin Griffin saw extensive time as a backup corner. The Cougars did hold USC scoreless from midway through the second quarter until midway in the third. The defense held while Falk found his rhythm, eventually completing 38 of 57 passes for 370 yards and a pair of touchdowns despite the conditions and the drops. He also picked up a couple first downs with his legs, and showed very good awareness in the pocket in his first live action against a good team since high school. Leach called short passing plays for the redshirt freshman at first and gradually allowed him to work his way downfield. The Cougars held up well in the run game for three quarters, limiting Javorius Allen to 12 carries for 54 yards, most of which came on a single 19-yard gain. But he added another 60 in the fourth quarter, extending his streak of 100-yard games to six. But what irked Leach as much as the dropped passes or the long touchdowns given up on defense was his team’s reaction to those plays. Published: Nov. 1, 2014, 5 p.m. Updated: Nov. 1, 2014, 11:41 p.m.